House of Cards' official Twitter handle on Wednesday shared a short video of Robin Wright, who will be seen as US President Claire Underwood in the upcoming and final season of the show. House of Cards Season Six will stream on Netflix later this year. The makers of Netflix series House of Cards recently unveiled a teaser on the occasion of U.S. Independence Day. 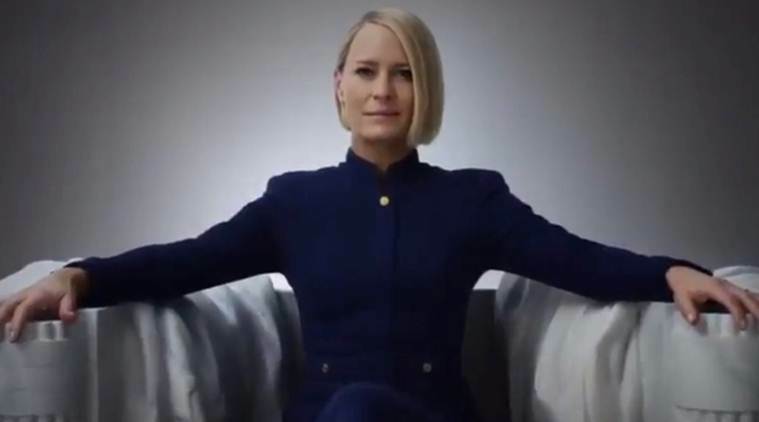 House of Cards’ official Twitter handle on Wednesday shared a short video of Robin Wright, who will be seen as US President Claire Underwood in the upcoming and final season of the series. In the video, Mrs Underwood wishes, “Happy Independence Day…to me.” The wish is followed by the hashtag #MyTurn. This is the second House of Cards Season 6 teaser following the exit of Kevin Spacey from the popular series. Spacey was fired after multiple men and women accused him of sexual misconduct in the wake of Harvey Weinstein scandal. The eight-episode season 6 of House of Cards will revolve around Robin Wright as US President Claire Underwood. The show will also see Diane Lane, Greg Kinnear and Cody Fern joining the cast. Michael Kelly, Jayne Atkinson, Patricia Clarkson, Constance Zimmer, Derek Cecil, Campbell Scott and Boris McGiver will return to the series.